Social media evaluation and analysis is one of the essential parts of social media marketing. Not only do these data provide the information about the success of the social media marketing that has been used, but the data also help businesses find out about the weaknesses of the strategy they have chosen. As a result, this might completely affect the approach and the strategy used on social media. Since social media are connected to various other segments of business and online marketing, social analytics can also affect those segments. For example, social media analytics might determine discrepancies when it comes to target audience, which might affect the approach on social media. This can also affect the overall marketing in the company, as it might influence the packaging, the TV commercials, etc. Facebook Insights help you with tracking statistics on your Facebook page. The dashboard provides a lot of options to get insights related to various aspects of your page, including engagement, reach, popularity, visits, etc. In order to access the insights, go to the timeline of the page you manage, and click on the “Insights” tab. You should simply choose the time period for which you want to examine the data, and the insights will be filtered in order to show the statistics of your page activity. Overview – This is the page summary, and it features the overview of the most important metrics including reach, post engagement, page likes and page views. These metrics are further analyzed in separate sections of the page insights, offering more in-depth data about each of them. Likes – This part of the insights include the total amount of likes and unlikes on your page over the time period you have chosen. It also provides details about where likes happened, meaning you will see whether the users came across your page and liked it by using search, by recommendation from a friend, etc. Reach – Here you can find complete details about your posts reach, including the number of people who have seen your posts, the actions that help with increasing reach, such as the number of likes, comments and shares, as well as the actions that decrease the reach of your posts, such as hiding a post, unliking the page, etc. Page views – This part of the insights shows the number of views by page section (home, posts, photos, about, other, etc). You will also see the chart with details about your audience, which can be sorted by section, age and gender, country, city and device. Actions on page – This is a very helpful part of insight with the data about the people who clicked on the action button and people who clicked to get directions. The additional options provide information about the posts (including reach and engagement for each of them), events, videos, people and messages. 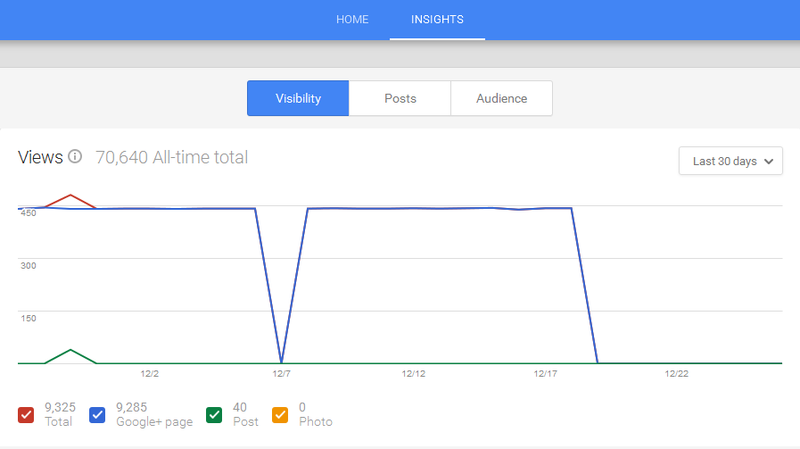 If you manage a Google+ page, you will also get an access to the insights related to the page’s performance. To access page insights, sign in to Google My Business and make sure you are using card view. Click on the “Insights” tab of the page you would like to manage. Visibility – Find out the number of views for the selected time period. Besides the total number of views, you can also see the number of posts, profile and photo views. Engagement – The following segment of the Google+ insights provides the data about engagement for the selected period. You will see actions on a post, which includes +1’s, comments and shares, the number of actions and views of the recent posts, as well as the average actions by post type. Audience – The final segment provides the data about the users. Monitor the number of followers for the specific time period. If you have more than 200 followers, you will get access to the additional metrics, which include the number of followers by country, the age and the gender of the followers. Shortening services have become very popular for short, custom links on social media, as well as on websites. 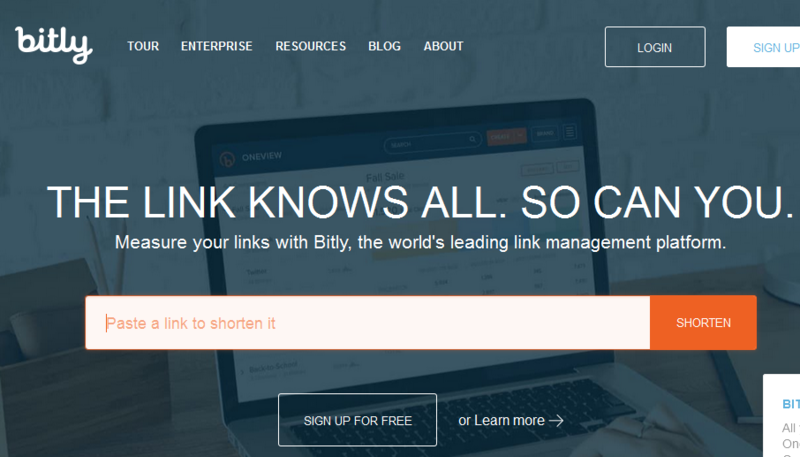 One of the most famous shortening services is probably bitly.com, but there are other online platforms and applications that provide similar functionality. Short links are great for reducing the length of the links, especially if you have a limited number of characters to be included in the status update. In addition, shortening services allow tracking the clicks of each links shortened using the service. Besides tracking the number of clicks, you will also get additional information such as the number of clicks per country. If you share the same link on several social media accounts, you will get the exact data about the number of clicks from each of the social networks. This way you can analyze the success of sharing content via social networks, in order to determine which social network generates the largest number of clicks. You can shorten any link, regardless if the link is from your own website, an online store, a social account, etc. You can even shorten the links that are from other websites. Although Google Analytics is a tool that is mainly used to monitor traffic on a website or blog, as well as the performance of the AdWords campaigns, there is a section in Google Analytics that can help with monitoring the performance of social networks. However, you will not be able to get the exact data about your own page, but instead you will get the number of referrals from social networks in general. In this way, you are not able to measure the performance of your own social network profiles, but instead you will be able to measure the popularity of your content on social networks in general, by comparing the number of clicks from different social networks. The number of clicks in this case can only be tracked if you have Google Analytics integrated on your website. You will be able to get the data from Google Analytics only in case you are the owner of the website, and you have the access to Google Analytics account that is linked to your website. Some management tools that are used for social media management offer statistics as the part of the services integrated within the account. If this is the case, you can use this feature to track the performance of social networks, without the need to analyze the insights of each network separately. Social analytics refers to the evaluation of your social media accounts in order to determine the efficiency of the strategy you are using. It consists of measuring, analyzing and interpreting the data from social analytics. Website report – This includes statistics from your website which highlights the traffic and conversions originating from social media accounts. Customer response – When customers provide feedback and their response, related to the service you have provided, you might get the idea to which extent they benefited from social media. Reach and virality – The data you get from social media statistics and trackable links can also provide general insights into what kind of social media approach works best. Social analytics helps you determine the current trends and tendencies in the world of social media, which is changing constantly. Being up-to-date with the latest developments can help you increase the effectiveness of social media marketing, as well as to make sure that you are using the best practices and recommendations related to social media websites. This way, not only will the strategy be up-to-date, but the overall social media approach will follow the current guidelines. In addition, if you use social networks to promote sales on your website or in an online store, using social insights will be extremely helpful as you will find out which social network generates the most revenue. As a result, you will determine if you should improve or change your approach on certain networks, or if you should perhaps completely give up using a certain network, due to low response. Furthermore, you will also get the data about the users, such as their location, gender or age, which will help you with determining your target audience.